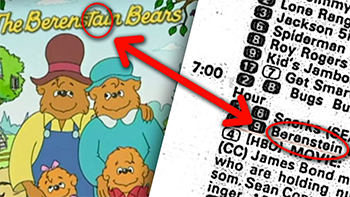 Just for the record: Yes, it was always "Berenstain," and no, you are not living in a parallel universe. The English Romanization of his name was a debated topic for quite some time, with interpretations including "Violenjiger", "Violent Jiger", "Violent Chigger", "Violen Jig-er", "Violin Juggler", "Bio Ranger Iga", "Valium Chugger", and "Crazy Engrish Fun-Man". The publication of The Ark II finally provided us with an official spelling. This trope describes characters whose names are almost never spelled consistently, usually because of transliteration issues. This tends to happen in Anime and Japanese video games that haven't been officially translated into English, although it also crops up in other languages that don't use the Latin alphabet. Situations include anything from drama between vowel additions to unique-cipher dropping, due to phoneme sets and writing systems. English, for example, is famous for many ways and rules of spelling (e.g., Americans generally dropping extra vowels such as in the word color, as compared with its British spelling colour), despite having far fewer actual sounds they represent. Japanese has separate vowel-heavy syllabic and ideographic writing systems; since the latter overlaps with Chinese, sometimes there is a question of whether a name should be transliterated from the Japanese or the Chinese reading. Spanish has several familiar looking letter combinations intended to be pronounced in specific ways. Complicating the issue is that some names simply become popular enough in other languages that they're modified to fit them better, and you can't be sure if it's actually intended to be meaningful. Another complication is when the name is only ever shown in modified form, meaning we simply have to guess. Assuming an official release settles the issue, some fans deliberately use one of the alternate spellings to establish their "credibility" as fans. In true fan fashion, this often persists even in the face of overwhelming evidence to the contrary, such as Theme Naming, Meaningful Names, Prophetic Names, and direct proclamations by the work's creator. Eventually, this stops being cool and just starts making people angry, and the self-righteous morons hit the Fandom Berserk Button. In some cases, official translated versions will adopt bizarre transliterations for the sake of Writing Around Trademarks and/or establishing new ones—because, when a Cash Cow Franchise gets imported, it's more useful to have character names that can be trademarked for the sake of selling licensed merchandise. This trope is omnipresent with Greek. The convention in English is not to transliterate, but instead to Latinize, Greek nouns and names. Hence nigh unpronounceable Latinizations like "Cynoscephalae" instead of "Kynoskefali" for Greek Κυνὸςκεφαλαη, "dog's head". This can also occur in translations of ancient texts written in outdated forms of modern scripts. For example, early Latin had no "J", but, as English has no consonantal "I", "J" is often used to signify such (notwithstanding that Y is actually the closest equivalent to a consonantal I in English). To a lesser extent, this can occur when transliterating words that contain a thorn (þ), which is already well represented by "TH". In point of fact, it can even be seen in many English texts from before standardized spelling (yes, there was such a time), won ecksampel beeing þis frais. And anoþre beeing þis sentans. Þis won heer is a partickularlie gud ecksampel. The trope's name comes from an Isaac Asimov short story, "Spell My Name With An S" , in which a pair of Sufficiently Advanced Aliens use The Little Shop That Wasn't There Yesterday to stop The End of the World as We Know It—by persuading an obscure scientist to change one letter of his name from Z to S, and watching Hilarity Ensue (until they realize that The Watcher will know that there was supposed to be an Earth-Shattering Kaboom, and so are forced to come up with an equally subtle Reset Button). Asimov was inspired to write the story after having his name misspelled—Azimov, or even Asenion once—one time too many. Incidentally, Isaac Asimov's original name in the Cyrillic alphabet was "Исаак Озимов" (Isaak Ozimov, with the initial "I" pronounced like "ee") and pronounced quite differently from how the American public and he himself pronounced it during his lifetime. Now in Russia, translations of his works use the spelling of "Айзек Азимов" Aizek Azimov) to better convey the American English phonetics, out of respect for the author. While it may apply to some folders this trope shows up on, this page MAY NOT include minor differences in romanization systems, such as the various methods of indicating long vowels in Japanese, or the use of the apostrophe to indicate syllabic nasals. VERY FEW EXAMPLES WILL BE MENTIONED AS THERE ARE TOO MANY TO LIST. Contrast My Nayme Is, which is the intentional misspelling of one's name. The opposite of No Pronunciation Guide, which is when the spelling/writing of the name is unequivocal but people can't agree on how it's supposed to sound. The tlopes can ovelrap, howevel, if a celtain sound does not exist in a a palticural ranguage. May lead to a Who Names Their Kid "Dude"?. Related to Adaptation Dye-Job (and/or other Adaptation Tropes, as the case may be). Compare with Rouge Angles of Satin, when a word or name is spelled incorrectly in a way that it is confused with another existent word. Brivolbn7q Regan: "Anyway I met his woman, her name was ah, Amy, you know, so I go 'Oh, A-M-Y?' She goes 'No, A-Y-M-I-E'. 'Ughhh... I have to take a nap! I'm Brian, B-R-I-V-O-L-B-N, the number 7, the letter Q—'Brennemenahgah!!!' Look at my name tag, it's, it's big." Operator: That's Kaplan? That's K as in "knife"? In Over the Hedge, the name of Verne's nephew constantly alternated between Plushie and Plushy. In Garfield, Pooky the teddy bear's name was misspelled "Pookie" at least once. In earlier strips of Dogs of C-Kennel, Will's name was originally Willy, before finally just going by Will. X-Wing Series: The various weird spellings of Klivian, lampshaded by the man himself. Tom Poes: Professor Zbygniew Prlwytzkofsky, who specifies his name with the following non-helpful clue: It's spelled with a "z" in the middle. De Kiekeboes: Mr. Osnoprodavonoblikavitch in the album Hotel O who's never been able to remember his own surname. He shortens it to the letter "O", despite other people miraculously remembering it without any mistakes. Writer J.M. DeMatteis, who wrote Kraven's Last Hunt and introduced Alyosha (Kraven's second son and the second Kraven), writes Kraven's surname as "Kravinov" rather than "Kravinoff". Overlapping with Adaptation Name Change, when Brian Bendis brought Jean DeWolff and Curt Connors (The Lizard) into Ultimate Spider-Man, he spelt their names "Jeanne DeWolfe" and "Curt Conners". The original Bat-Girl, currently known as Flamebird, was originally Elizabeth "Betty" Kane. Starting post-Crisis her name has been written as "Bette". The third (or second, it really depends who you ask) Batgirl, Cassandra Cain, was given the name Black Bat after she gave up the Batgirl name. Some writers, however, spelled it Blackbat instead. Some writers change how you spell the name of Dinah Drake, the original Black Canary, because she shares her name with her daughter (Dinah Lance). In one panel of Jem and the Holograms Eric's name is written as "Erik" on his coffee cup. This is possibly an in-series version of this. In one issue of Werewolf by Night, Buck Cowan's last name is misspelled as Cohen. The spelling of Jack's father's first name also alternates between Philip and Phillip. The name of Diabolik's character Elisabeth Gay has been misspelled as Elizabeth, Elisabet, and even Elisabetta (the Italian equivalent). Also, Eva Kant's last name is often mispronounced "Kent" by readers. Amazing-Man, the character, was usually spelled with a hyphen, but not always. The series he starred in was apparently formally titled Amazing Man Comics, although the cover title did use the hyphen until it was redone two years in (and shortly after that, Centaur went out of business). Motu Patlu has this sometimes. It's either Motu or Moto, and it's either Dr. Jhatka or Dr. Ghatka. In Ralph Bakshi's The Lord of the Rings, Executive Meddling led to Saruman's name being changed to Aruman, because the studio thought that viewers would confuse his name with "Sauron". However they only used the new name about half the time, making everything that much more confusing. The potential for confusion between their names is actually noted in the universe—while viewing an 'S' painted on an enemy's shield, one of the characters wonders if it stands for Sauron; another character quickly points out that Sauron's minions don't call him by name, and besides, Sauron never uses elf-runes. So it could only be Saruman. Lampshaded in DM of the Rings here . Fievel in An American Tail, who is listed as "Feivel" in the beginning credits of the first movie, which is the actual Yiddish spelling. The spelling was changed to "Fievel" to avoid confusing American audiences who might otherwise pronounce it as "Fay-vel", but in other countries where the movie was released the "Feivel" spelling was left intact. Ironic because that's actually how it's pronounced in Yiddish too. There's Prince Hans' All There in the Manual last name, Westerguard... except considering the fact that Jennifer Lee never directly stated in her post how to spell it, it's been spelled as Westerguard, Westergard, and even Westergaard. Considering she didn't correct the poster who asked the question though, it can be assumed that Westerguard is meant to be correct. The book A Frozen Heart uses "Westergaard". The country Elsa rules, Arendelle, is often misspelled by fans. Supplementary material isn't consistent on how to spell the names of Elsa and Anna's parents. "Agnarr" or "Agdar"? "Idun", "Idunn", or "Iduna"? One of the first examples may be the Sorcerer from Fantasia, all due to his name having been only a code-name between animators for decades, and popping up for the first time to the public in a Japanese video game. Is his real name Yen Sid, or Yensid? Bambi's mate, Faline, is often subjected to this, having her name frequently misspelled as "Feline". In Despicable Me, when Gru's profile is shown on Miss Hattie's computer, his first name is spelled as "Felonious," and in the Gru Family Tree, it's spelled as "Felonius." Is the fairy from Peter Pan called "Tinkerbell", "Tinker Bell", "Tinkerbelle", or "Tinker Belle"? Though she's frequently called "Tinkerbell", "Tinker Bell" seems to be the canon spelling as the original book uses it and the Disney Fairies books do as well. Lilo & Stitch: Mertle Edmonds' first name is often misspelled as the more common "Myrtle" with a "y". Practically any monster from a Godzilla movie—including Godzilla (originally Gojira) himself. Angirasu/Angilas/Angurus/Anguirus (the last finally being registered as a trademark in the 90s). Kingu Gidora/Ghidrah/Ghidorah; also Death Ghidorah/Desgidora. In almost all English versions except Godzilla vs. Mechagodzilla II (1993), the monster Radon (from "pteranodon") is called Rodan. Speculation as to why it was changed includes confusion with the element radon and a conflict with the name of a British brand of soap; nobody's exactly sure why. Kingu Shiisaa/King Seesar/King Caesar—especially problematic because it implies a false Meaningful Name (Caesar = Roman emperors) while clouding its real one (Shiisaa = Okinawan mythic lion-dog). In Godzilla vs. Destoroyah, the monster's name was deliberately changed from "Destroyer" because a descriptive name like that is hard to trademark. Also, Destoroyah has been called Destroyah. Likewise there's Kamacuras/Gimantis and Kumonga/Spiega. It is lampshaded in the American remake (And referred to exclusively as "Gojira" in the accompanying novelization). Randall Graves is not a clerk at RST Video. Randal Graves, however, is. Depending on the source, the heroine of King Kong spells her name as either Ann or Anne. Same goes for the heroine of Legend (1985)—her name is either spelled Lili or Lily, and not even the film's own fandom is sure which is correct. The tablet owner from Night at the Museum's name is popularly spelled Ahkmenrah, but other spellings exists as well. In the Nintendo DS Licensed Game of the movie's sequel, they added the spelling "Akmenrah" and "Akhmenrah", which was mentioned during the beginning, when Jedediah called Larry on the phone. The Hangover: Is it rufilin or roofalin? Qo'noS is titled "Kronos" in Star Trek Into Darkness. The script for Star Trek VI: The Undiscovered Country had used the "Kronos" spelling, and background references mention that it is the anglicanized version of the Klingon word. Some of the rip-offs of Emmanuelle spelled her name as "Emanuelle" to avoid law-suits for copyright infringement. Krzysztof Kieślowski's films are often victim of spelling errors to people unfamiliar with Polish naming conventions. Whenever you read an article about this director have fun checking out whether his name is always spelled correctly. In It Should Happen to You, it's Gladys with a "y" instead of an "i". The Japanese band Bow Wow later switched the Latin spelling of their name to Vow Wow. This might have been to avoid confusion with another band named Bow Wow Wow. Most of her CDs Romanize her name "Shéna Ringö", but she's gone through plenty of other Romanizations, so almost nobody humors her and instead goes for the literal Romanization, Shiina Ringo. Florence and the Machine, or Florence + the Machine, or even Florence + the machine? Nobody can decide. Woven Hand or Wovenhand? He's released albums as both. How many times has the media spelled Meat Loaf's name as one word, "Meatloaf"? Don't ask. Keri Hilson, Kerri Hilson, or Kerry Hilson? Someone might even go as far to spell it Kari Hilson. The first of those names is correct. Isao Tomita's album Snowflakes Are Dancing and its title track appear to be named for a translation back into English of the Japanese name for this track. Debussy's name for it was The Snow Is Dancing. A more subtle example is Golliwogs' Cakewalk from the same album. Debussy named this piece Golliwogg's Cakewalk, referring specifically to the heroic character created by Florence Kate Updike, and not the generic archetype (particularly not Enid Blyton's racist version). Record Producer and session guitarist Dann Huff's name is frequently misspelled with only one N.
Fall Out Boy's name is frequently written as "Fallout Boy" or even "Falloutboy". The Belgian rock band dEUS spells its name with a small d and capital letters. It's Twenty One Pilots, not 21 Pilots. When someone just puts the numbers rather than spelling them out, it's a sign that they're not into the band or don't know much about them. You can easily tell that an interviewer has not done their research if the video title refers to them incorrectly, and only the newest fans that have just discovered their music spell it wrong - the older ones all know better. Despite being American The Neighbourhood doesn't spell their name "The Neighborhood". Tell that to fans though. Lady Gaga is often referred to as Lady GaGa or Lady Ga Ga by people unfamiliar with her. Country Music singer Janie Fricke couldn't seem to make up her mind as to whether her last name was spelled "Fricke" or "Frickie". Her albums used both spellings. ABBA: Because the group's name is an acronym of their initials, it should be spelled "ABBA" (all caps), not "Abba". Also, Frida's name (Anni-Frid Lyngstad) was frequently misspelled, even at press conferences. Double-s Andersson (Benny) vs. single-s Anderson (Stig). K. T. Oslin's 1990 single "Mary and Willie" is sometimes missing its final E. The album spells it "Willi", but Joel Whitburn's Hot Country Songs book spells it "Willie". Invoked by Country Music singer Neal McCoy. His real last name is McGaughey, which he changed to the phonetic spelling of McGoy early in his career. He ultimately changed to the more common McCoy due to people constantly getting "McGoy" wrong. Shawn Michaels's group of friends either goes by The Kliq or The Clique. The Japanese wrestler Ebetaroh...or is it Ebessan? Kikutaro? Promotions will often switch between these and other variations every time he makes an appearance, sometimes as part of a Running Gag. Princesa Sugei is best known among English speakers as Princess Sugey but also known as Princesa Sugey, Princesa Sujey, Princesa Sugeth, Princess Sujei, Princesa Sujeith, Princess Sugehit and every other combination of those letters. Again, this is a Spanish example so you'd think it'd be settled quickly but the Mexican promotions themselves can't seem to keep it straight. Most lucha libre enterprises tend to spell their names Faby and Mary likely because the latter is a very common name, yet it is very common to see the Apache sisters spelled Fabi and Mari instead online and in publications, likely because their full names are Fabiola and Mariela. It's Low Ki, not Loki, that guy's Mexican. Loki himself has sometimes been called Lucky. Also, Kawal became Kaval when he made the move from WWE's version of FCW to NXT. While most official sources seemed to agree the wrestler's name is El Texano Jr, it is not uncommon to find the name written as Tejano Jr with a j instead, a j making a completely different sound than the one that then follows. This is confusing because Texano and Tejano were two completely different wrestlers, thus the son's lineage would suggest x.
Candice Michelle was infamous for accepting both Candace and Candice without preference, though the latter is most often accepted as the proper spelling. This was one of the tropes that led to the downfall of Dragon Door Project. There were a dozen derivatives of the Tiger Mask and Ultimo Dragon gimmicks, including a guy going by Tyger Mask, who would later become Xtreme/Extreme Tiger. CMLL has always used Ephesto for the former Hombre Sin Nombre but Hefesto is sometimes used by others having the Greek god in mind. When Jennifer Blake moved from EAW to AAA, she was briefly billed as Jennifer Blade. For nearly a decade fans had known him as "Punisher Martinez" but after getting regular Ring of Honor bookings in the 2010s he made a fairly significant effort to correct that to "Punishment". Specifically "The Punishment Damian Martinez", though that's pretty hard to turn into a Crowd Chant, or trending twitter topic. Given that he wrestled most of his career in the US, this is probably less a language problem and more him wearing a red eyed fanged skull shirt as entrance gear, which is slightly similar to the uniform of comic book character who is called Punisher. Promotions in Puerto Rico, Mexico and Chile frequently misspell Santana Garrett in promotional material as Zantana, World Wrestling League in particular switching back between "Z" and "S" several times just a few minutes. AAA often just uses her TNA billing, "Brittany". The name of retired syndicated radio host Neal Boortz has often been misspelled as "Neil", but he considers this spelling "wimpy". The drow chief god in some Dungeons & Dragons settings is either spelled Lolth or Lloth. The Europa series of World War II games used English transliterations of the actual names of places, but the designers also declared that diacritical marks would not be used. To say that this annoyed French speakers is an understatement. The play "The 25th Annual Putnam County Spelling Bee" had audience members spell words. Sometimes audience members would be given the word "kumis", fermented goat milk. If the audience member spelled the word c-u-m-i-s, the announcer would say the correct spelling was k-u-m-i-s (both spellings are correct). This could be deliberate, as half the comedy in the show derives from the announcer trying to eliminate audience members at any cost. The Merchant of Venice contains a character called, depending on the editor, "Launcelot" or "Lancelot". This doesn't seem so bad...except that the folios call him "Launcelet" or "Lancelet", and spell his last name, Gobbo, alternately as "Jobbe" or "Job". Rumpleteazer. Spelled Rumpelteazer in the original poems and on the official website, but credited as Rumpleteazer in the 1998 movie version. The -le spelling is now more common. The z is also occasionally substituted with an s.
McAvity and Tantomille are common misspellings of Macavity and Tantomile, respectively. Satoko and Satoshi's last names are sometimes spelled "Hojo" and "Houjou". The English version of the manga went with "Hojo". "Onikakushi" (Demoned Away) is the first arc. "Onigafuchi" (Demon's Abyss) is what Hinamizawa used to be known as. As well as confusion between the two, the latter is sometimes spelled with a double C; this is wrong as it would imply a doubled consonant in pronunciation that's not there. Both u's in Rena Ryugu are long, so it can be written Ryuuguu. The other common variants, "Ryuguu" and "Ryuugu", are erroneous. Hanyuu's sword is the Onigari-no-Ryuo, or Ryuuou if you write out the long vowels. The incorrect "Ryou" is often seen. The English translation of the manga writes Hanyuu's name as "Hanyu". The Sunrider games and their official website seem to be in disagreement over how certain characters names should be spelt. Is Solas full name Sola di Ryuvia, or Sola vi Ryuvia? Is it Claude Trilleo, or Claude Triello? The games consistently use the former spellings, while the website and promotional materials use the latter. Saber, or, rather, SEIBA! from Fate/stay night is identified in Character Material IV as "Altria," but the most commonly-used spelling according to Google is "Arturia," followed by "Artoria." Both have their logical points: Saber is, in fact, King Arthur. "Arturia" could be a plausible feminization of Arturus, while "Artoria" IS the feminine of Artorius, a Roman family name some historians have connected to the Arthur legend. Some fans argue that "Altria" is canon, while others say that it should be given no more credence than El-Melloi II being styled "Load" instead of "Lord." Other Type-Moon examples: Is Ilyasviel's Servant Herakles, Heracles or Hercules? Is Ilyasviel herself spelled with one or two L's in the first syllable? Fate/Grand Order threw the fandom a curveball by apparently romanizing Mashu's name as "Matthew." For the moment it seems she's been canonized as just "Mash." Grand Order also brought in a particularly amusing example in the form of Chaldea's special observation system. Most people thought it was called "SHIVA", after the three-eyed, supreme Hindu god. That is, until the Salem chapter, where it malfunctions and summons its legendary, clairvoyant namesake... the Queen of Sheba. Hilarity, and a number of wiki edits, ensued. It's an ongoing joke that everyone misspells Grif's name. Church: He's Grif. Which is spelled with two Fs. Grif: Goddammit! Okay, now that's another thing! Church: Caboose was very specific about that second F.
It actually applies a lot to RvB's producer. Similar to the Fall Out Boy example in the Music folder, Rooster Teeth's name gets frequently misspelled as one word ("Roosterteeth") or as a CamelCase word ("RoosterTeeth"). Homestar Runner: Doreauxgard. The only source for the spelling of his name is an XML file. Some senders of Strong Bad Emails misspell Strong Bad's name as Strongbad, which he often mocks and corrects. Strong Bad: (reading "Hey Strongbad" in an email) Hey two words. Two different words. That are not one word. That are "Strong" and "Bad". Peasant's Quest also does this - if you type "make friends with Kerrek", the game responds "Look, it didn't work for Strongbad and it's not gonna work for you either." In Movie Rehab, the main character's name is not spelled Sag. The name is spelled SaG, just with a big G at the end. Albi and Azul. Is it spelled "Abbi" or "Albi"? The video titles spell it "Abbi", but the series intro spells it "Albi". Happens among Noob fans. Note that the series is set in a MMORPG and basically everyone is literally walking around with their Online Alias hanging over their head, making the right spelling a Freeze-Frame Bonus at worse. The subs for Vaguely Recalling JoJo series spell Avdol as Abdul. According to the rules of Arabic, both spellings are correct. Happens a lot in Critical Role, especially with the non-player characters. Sometimes Matt clears up the spellings, but so far we've had issues with K'varn/Kavarn, Clorota/Clarota/"Clarence", Kern/Kurn, Kynan/Kainen/Kainan, and, of course, the many possible permutations of Percival Frederickstein von Musel Klossowski de Rolo III, which is always said Motor Mouth style - at this point the proper spelling of that is anybody's guess. Sean/Shaun/Shawn Gilmore would be more of an issue, except that everybody just calls him Gilmore. The angels in Welcome to Night Vale are all named Erika. With a "k". They can hear when you spell it wrong. Charleyyy, the star of Bowser's favorite Show Within a Show, Charleyyy and Friends, has his name spelled with three Y's. In the episode "Black Yoshi's Girlfriend Problem! ", Yoshimeet.com, a dating website for Yoshis, is always referred to in-universe as "Yoshimeet.com with two E's." At one point in the episode, Black Yoshi logs onto Yoshimeat.com, and is horrified by what he sees (which isn't shown to the viewers). The Lazer Collection: The official spelling is "Doctor Octogonapus", though fans often spelled it "Doctor Octagonapus" or "Doctor Octagonopus". On the "Sunnie the Pikachu" blog, Sunflower's nickname is either spelled "Sunnie" or "Sunni", though the former is the most consistent spelling. Is Brittani's name spelled name spelled "Brittanie", "Brittani", "Britni", or "Britani"? So far the most constant spelling seems to be "Brittani". From Killerbunnies (the wiki), Oleander's nickname on her official image is spelled "Imogen", whereas here and her profile it's spelled "Imogene". Then again, it is possible it couldn't be spelled that way because of the character limit in the name boxes on deviantArt. The 23rd Foot, or 23rd Infantry Regiment in non-British terms, inverted the trope: their name is the Royal Welch Fusiliers. It is often misspelled with an "S". The name has disappeared with the amalgamation of various Welsh regiments. The British English tendency to double the letter "L" when it occurs at the end of a syllable has caused no end of grief to people named Philip. Not surprisingly, the name is Greek in origin. Spell My Name with a "The"